Dr. Vasant Balaji Athavale is the founder of the Paediatrics Department of Lokmanya Tilak Municipal Hospital, Sion (Mumbai) which' was established in 1959. He was the Head of the Department and Professor in Pediatrics there uninterruptedly for 30 years. In 1996, he received an international award - 'Best Author of Ayurvedic texts', In an international symposium on Ayurveda held in 2001, he was conferred 'Jeevan Gourav' (Lifetime achievement) award by the National Education Council. He has also written several texts on 'Parenting', Since he has good command over the Sanskrut language, he has written extensively and collected invaluable matter on various aspects of Spirituality. He has contributed all his writing to Sanatan's treasure of Holy texts. Even today, he continues to write on subjects related to Spirituality, He is H.H. Dr. Jayant Athavale's (Founder, , . Sanatcm Sanstha) elder brother. Dr. Kamlesh Vasant Athavale is Dr. Vasant Balaji Athavale's son. He has dedicated his life to the field of Pediatrics and has completed fellowship of the American University on 'Pediatrics' and 'Neonatology'. Presently, he is a 'Director of Neonatology' at Nash Hospital attached to Duke's University, Rocky Mount, North Carolina, USA. We are glad to bring out this special issue of Paediatric Clinics of India on the occasion of 15th International. Congress of Paediatrics, at Delhi. Ayurveda, the Indian system of medicine, literally means knowledge of life. It includes, art of living, science of health and philosophy of life. Though more than 5,000 years old, it is by no means an outdated science. Even today, people of India think and live according to the principles of Ayurveda. There are over 100 colleges all over the country, which teach Ayurveda in a systematic manner. Paediatrics, is one of the eight specialities recognised by Ayurveda. Kashyap Samhita is the Ayurvedic text book of Paediatrics. The goal of paediatrics is to see that every child grows and develops into a healthy, happy and useful citizen. Ayurveda insists that the birth of every baby should be well planned and should not occur as a matter of chance. The paediatrician should guide both the parents about their diet, activity and daily regime before conception, advise the mother during pregnancy and the child as well as both the parents till the child is 16 years of age. Obstetrics and gynaecology constitute part of paediatrics, as the birth of a healthy baby is the main aim of obstetrics and gynaecology. Birth is only an event, in the life of a child. Much more emphasis is laid on the development of a healthy and strong mind so that the child is trained to withstand all the stress and strains of life with a smiling face. Apart from medicines, many more aspects and principles of life can be learnt from this great science. I consider myself extremely fortunate, to be able to present to you the main aspects of paediatrics in Ayurveda in the form of 'Diseases in children (Ayurvedic concept)" that is science of child life. 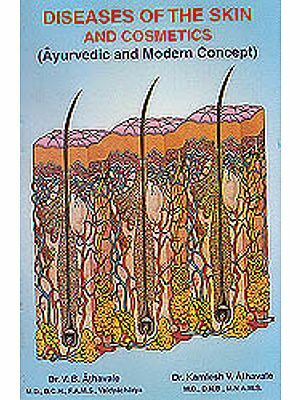 Ayurveda consists of 8 major sections, namely 1. Medicine, 2. Child life, 3. Surgery, 4. Surgery of head and neck, 5. Toxicology, 6. Bhutavidya or grahavidya, which includes a). Psychiatry, b). Infectious diseases and c). Diseases caused by supernatural power, 7. Jara, that is Geriatrics and Rasayana, that is science of improving the qualities of tissues with consequent increase in resistance and delay in the process of aging, 8. Vajikarana - sexology. Child life is one of the major divisions of Ayurveda. In "Ashtanga- hrudaya" and "Ashtanga-sangraha" child life is termed as 8alanga of Ayurveda. In Charak and Sushrut samhitas, it is termed as "Koumarabhrutya", that is, a section of Ayurveda dealing with child life with special emphasis on nutrition of children. According to Kashyap, paediatrics is the most important division of medicine, as the other divisions play their role only after the child matures into an adult. Childhood is divided into 1. Garbha, that is foetus, 2. 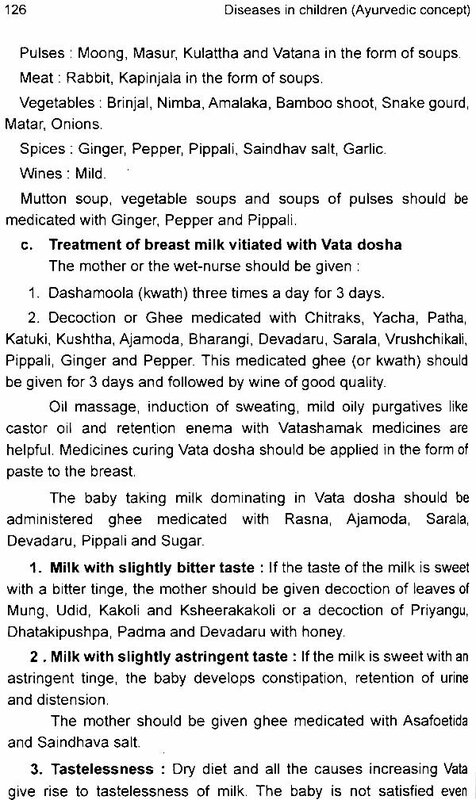 Ksheerada, that is, an infant entirely on milk diet - up to 6 months. 3. Ksheerannada, that is, an infant on milk as well as other food items - from 6 months to 2 years. 4. Annada, that is, mainly on food apart from milk - from 2 to 16 years. This period is further divided into a. Bala, that is, a preschool child between 2 to 5 years, b. Kumara, that is, a school child between 6 to 16 years. Life starts at the time of conception by the union of the sperm, ovum and the individual soul principle together with the mind. Birth is only an event in an individual's life. Childhood extends up to the age of 16 years. Growth and development is largely completed during childhood, though it continues to some extent up to 34 years of age according to Kashyap and up to 30 years according to Charak. Children have delicate bodies and their tissues are immature and not well-differentiated. They have not acquired full strength and hence do not tolerate severe physical exertion. Their digestive power, courage, knowledge, memory, control of desires, emotions and other mental processes are less developed than those of adults. However, they excel in the power of formation of tissues, the regeneration of tissues and the healing of wounds. By nature, they are attractive and pleasant. Menstruation starts at the age of 12 years in girls and secondary sexual characters develop during adolescence. In children, the Kapha element dominates and they are prone to Kapha disorders. The paediatrician's role begins even before conception and he should know all about the reproductive organs of both the parents and their diseases so that he can advise them regarding the diet, activity and medicines which are good both for procreation and for the offspring. Ayurveda does not have a separate section for obstetrics and gynaecology as it is considered to be an integral part of paediatrics. The goal of childhood is to see that the child develops into a healthy, happy and useful citizen. Hence, a paediatrician should know the characteristics of a healthy life, a happy life and a useful life.